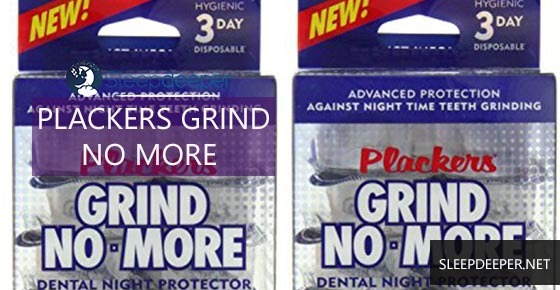 Plackers Grind No More Dental protectors are available over the counter in packs of 10, 14, 20 or more. These are disposable mouthguards that do not require a doctor’s prescription.The teeth grinding guards are hygienic as they come wrapped individually and can last for up to three days. The Plackers Grind-No-More dental guard can be worn on either the upper or lower molars. When you wear the guards, your upper and lower molars are protected by the contour bite plates that prevent you from grinding your teeth at night. This dental guard reduces enamel damage, jaw pain and headaches. There are various ready-made designs of the Plackers Grind-No-More. However, you may need to mold your own in case you do not find a fitting design. Plackers is a boil and bite guard. You need to heat the device in boiling water and then bite into the softened material to mold the shape of your teeth. Plackers Grind-No-More night guard is lightweight. This makes it easier for you to talk with the guard in the mouth. 1. What symptoms of bruxism are addressed by Plackers stop grinding night guard? This teeth grinding guard relieves you of jaw pain, headache, ear ache and facial pain that results from bruxism. The guards also protects your teeth from cracking and chipping as a result of the grinding habit. 2. How should I put the guard in my mouth? For the oral guard to fit properly, you should place the bite pads on the two back molars, either on the upper or lower teeth. 3. For how many hours can I wear my Plackers night guards? Ideally, you should wear the mouth guard for TMJ for a maximum of 12 hours. 4. After how long should I replace the Dental Night Protector? It is recommended that you wear the dental protector for a maximum of three nights. Over this time, your teeth grinding symptoms should have reduced. You can however replace the TMJ guard if you start noticing it is wearing out. 5. How do I care for my Plackers stop teeth grinding guard? You should clean the bruxism guard thoroughly with a mouthwash or cold water after use. After this,dry the dental guard and store in the container that it comes with. 6. How is Plackers Grind-No-More mouth guard different from other over-the-counter TMJ guards? Each Plackers grinding guard is packed in its own cases and should be worn for a maximum of three nights. This makes it more hygienic than other bruxism guards, which are worn for a longer time. Plackers mouth guard TMJ will prevent you from grinding your teeth. Moreover, the night guard is comfortable to wear. The night clenching guardis sold as one-size-fits-all and requires no boiling for it to be fitted. At the moment, the guard goes for [amazon_link asins=’B00C9A1F2Q’ template=’PriceLink’ store=’sdplug-20′ marketplace=’US’ link_id=’0849f86a-fd82-11e6-b90c-458019ad98b6′] at Amazon. Majority of people who grind their teeth have found Plackers night guards helpful in stopping the habit. Click the link below for full reviews of verified purchasers at Amazon. I’ve always loved this product however they must have changed the plastic they use. Not nearly as comfortable. Plastic is much harder and hurts your gums. I hope they return to the former formula.